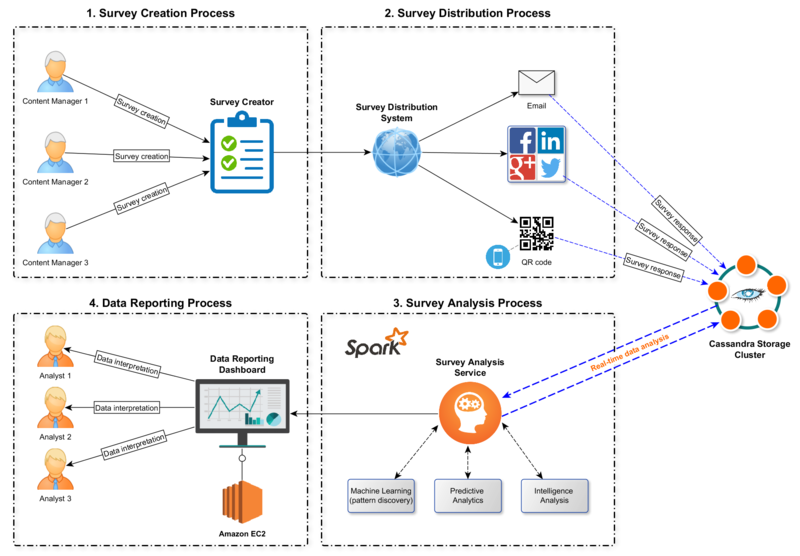 Survey BigData Analyzer consists of a suite of applications covering the entire process of gathering, modeling, and interpreting survey information for the purpose of discovering new market trends, customer preferences, and hidden patterns. The data processed by the custom analysis service is displayed via the Data Reporting Dashboard. The Survey Creator application allows content managers to create surveys for various areas of activity (retail industry, research activities etc.). All surveys are mobile-friendly and can be created using default templates or can be personalized with the help of custom templates. The Survey Distribution System is a component which allows users to automatically distribute the created surveys. The surveys can be shared on various channels, by email, social networking services (such as Facebook, Twitter, and LinkedIn), or by using QR codes, which is a good approach for mobile devices. The data gathered from completed surveys is stored inside Apache Cassandra clusters, which are located in different areas for a better geographical span, as well as to improve server availability and failover. All the data collected from surveys is stored as structured data in Cassandra, thanks to this management system’s capability to handle very large amounts of data. The Survey Analysis Service is able to perform real-time data analysis on the data stored in Apache Cassandra databases. Using the Apache Spark framework, the service is able to extract and prepare the data for visualization and predictive analytics. The Data Access Layer is implemented via Spark Cassandra connectors. The service comes with Cassandra Storage Cluster support, allowing jobs to be distributed across multiple nodes. Additionally, the data integration engine is capable of running multiple processes in parallel by using a multi-threaded architecture, which results in low execution times. The Data Reporting Dashboard shows the resulting information and statistics from the Survey Analysis Service. Based on the data processed by this service, the user can visualize and analyze data in order to create reports. Data analysts can then review the detailed information as a means for discovering patterns and trends.